Composer and Lyricist. Nationality: American. Born: Peru, Indiana, 9 June 1891. Education: Studied piano and violin as a child; attended Worcester Academy, Massachusetts, 1905–09; Yale University, New Haven, Connecticut, 1909–13, B.A. 1913; Harvard Law School, Cambridge, Massachusetts, 1913–14, and Harvard Graduate School, 1914–15; also studied orchestration and counterpoint with d'Indy, 1920. Family: Married Linda Lee, 1919 (died 1954). Career: 1916—first Broadway show (composer and lyricist); worked with Duryea Relief Party in France during World War I; 1929—wrote songs for film The Battle of Paris ; later musicals filmed (without Porter's participation) include Fifty Million Frenchmen , 1931, The Gay Divorcee , 1934, Anything Goes , 1936, Panama Hattie , 1942, DuBarry Was a Lady , 1943, Let's Face It , 1943, Kiss Me Kate , 1953, and Can-Can , 1959; 1936—first film score for Born to Dance ; 1937—riding accident, resulting in amputation of leg. Died: Of pneumonia, in Santa Monica, California, 15 October 1964. Cole Porter Song Album , New York, 1935. 103 Lyrics of Cole Porter , edited by Fred Lounsberry, New York, 1954. The Cole Porter Song Book , edited by Robert Kimball, New York, 1959. Cole , edited by Robert Kimball, New York, 1971. Music and Lyrics by Cole Porter , edited by Robert Kimball, New York, 1972. The Unpublished Cole Porter , edited by Robert Kimball, New York, 1975. The Complete Lyrics of Cole Porter , edited by Robert Kimball, New York, 1983. Ewen, David, The Cole Porter Story , New York, 1965. Hubler, Richard G., The Cole Porter Story , Cleveland, Ohio, 1965. Eells, George, The Life That Late He Led: A Biography of Cole Porter , New York, 1967. Kimball, Robert, and Brendan Gill, Cole , New York, 1971. Schwartz, Charles, Cole Porter , New York, 1977. Citron, Stephen, Noel and Cole: The Sophisticates , New York, 1993. Morella, Joe, Genius and Lust: The Creative and Sexual Lives of Noel Coward and Cole Porter , New York, 1995. Cuellar, Carol, editor, Porter on Broadway , Miami, 1995. Kimball, Robert, You're Sensational: Cole Porter in the 20s, 40s & 50s, Bloomington, 1999. Prince, Pamela, editor, You're the Top: A Song by Cole Porter , New York, 1999. Kimball, Robert, "The Cole Porter Collection at Yale," in Yale University Library Gazette (New Haven, Connecticut), July 1969. Nolan, J. E., "Films on TV," in Films in Review (New York), August-September 1973. Hemming, Roy, in The Melody Lingers On: The Great Songwriters and Their Movie Musicals , New York, 1986. 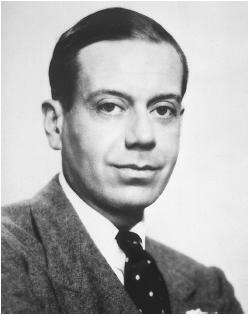 Custen, G. F., "Night and Day: Cole Porter, Warner Bros., and the Re-creation of a Life," in Cineaste (New York), vol. 19, no. 2–3, 1992. Gill, Brendan, "Deluxe Delights," The New Yorker , vol. 69, 31 May 1993. Forte, Allen, "Secrets of Melody: Line and Design in the Songs of Cole Porter," Musical Quarterly , vol. 77, Winter 1993. Clark, Robert S., "You're the Top: Cole Porter in the 1930s," in Hudson Review , Winter 1993. "The Secret Life of a Music Man," in Maclean's , 19 October 1998. Schleifer, Ronald, "'What Is This Thing Called Love? ': Cole Porter and the Rhythms of Desire," in Criticism , Winter 1999. Urbane, witty, incisive, and, sometimes, sentimental, Cole Porter's music brought a true sophistication to the Hollywood movie musical. Versatile as well as stylish, he provided tailor-made material for a wide range of talents, from Fred Astaire to Ethel Merman to Bing Crosby. Porter was born on a farm near the town of Peru, Indiana. Heir to a large fortune, he studied at Yale and entered Harvard Law School which he soon abandoned for music. Porter was equally talented as a composer and a lyricist, allowing him to work alone. He struggled to establish himself in the New York theater during the 1920s, finally breaking through in 1929 with his score for Fifty Million Frenchmen . The 1930s followed with an indefatigable series of distinctive scores and hit tunes. His first few adaptations on film were less remarkable. His songs "They All Fall in Love" and "Here Comes the Bandwagon" were included in an early talking picture, The Battle of Paris ; Warners' screen version of Fifty Million Frenchmen did not use Porter's lyrics, and his music was reduced to background instrumentals. Porter's score for The Gay Divorce , retitled The Gay Divorcee , did not fare much better; only "Night and Day" survived from the original. It was not until Porter actually moved to Hollywood in 1935 to write a complete score for Born to Dance that he became significantly involved in writing for motion pictures. From then until his death in 1964, Porter continued to divide his time between New York and Los Angeles, spending four to six months each year on the west coast. Porter began his Hollywood career in earnest at MGM, and although he worked for several important studios, MGM's lavish budgets and tasteful pictures gave Porter's music and lyrics their proper setting. Likewise, Louis B. Mayer provided Porter with a working relationship which respected the composer's talent and sensibilities. Some of the films containing Porter's songs have faded in relative obscurity, such as Born to Dance or Rosalie , but the melodies in them ("I've Got You under My Skin" and "In the Still of the Night") continue to be as fresh and provocative as when they first appeared. And while the censorship which prevailed in Hollywood during Porter's lifetime frequently forced changes in his original lyrics, they seemed to survive the limitations, to emerge equally biting and remarkably clever. Porter's cinematic successes and failures proved unpredictable. "Don't Fence Me In," an unpretentious cowboy song which was introduced by Roy Rogers in Hollywood Canteen , sold millions of copies, while the film version of Kiss Me Kate , Porter's longestrunning broadway show, was a disappointment at the box office. Porter's music also inspired several classic dance sequences—particularly, Fred Astaire and Ginger Rogers' "Night and Day" ( The Gay Divorcee ); Astaire and Eleanor Powell in "Begin the Beguine" ( Broadway Melody of 1940 ); and Gene Kelly's tour de force "The Pirate Ballet" ( The Pirate ). Throughout his life, Porter promoted entertaining stories of his heroic days in the French Foreign Legion and of his carefree life on the Riviera, which were as much fiction as fact. So, in 1945 when Warner Bros. produced a film biography of Porter's life which indulged in more than the usual literary license, Porter could hardly complain. Censorship prevented the studio from addressing his homosexuality, so it compensated by overly romanticizing his marriage to the society beauty Linda Lee. The casting of Cary Grant as Porter and the inclusion of an impressive collection of 14 of his already famous songs helped make the film a box-office success. Originally, the producer intended to cast various celebrities performing the numbers they made famous, but, in the end, only Monty Woolley (Porter's close friend) and Mary Martin, recreating "My Heart Belongs to Daddy," were engaged to play themselves. The composer projected two distinct images to the public—Cole Porter the glamourous, naughty bon vivant , and Cole Porter the diligent, prolific worker. Whatever engaged him, Porter seemed to attack it with an unquenchable zest for living. In the fall of 1937, however, his life dramatically changed when a fall from a horse crushed both legs, resulting in over thirty operations, and the eventual amputation of his right leg. Although his career was fully resumed by the end of 1938, Porter suffered intense pain the remainder of his life. Bouts of depression became so severe that he underwent electroshock therapy. Still, his music continued to express unmistakable vitality and vigor.